That just one boy died was the only good news to come out of a tragic 1915 automobile accident in Auburn, New York. 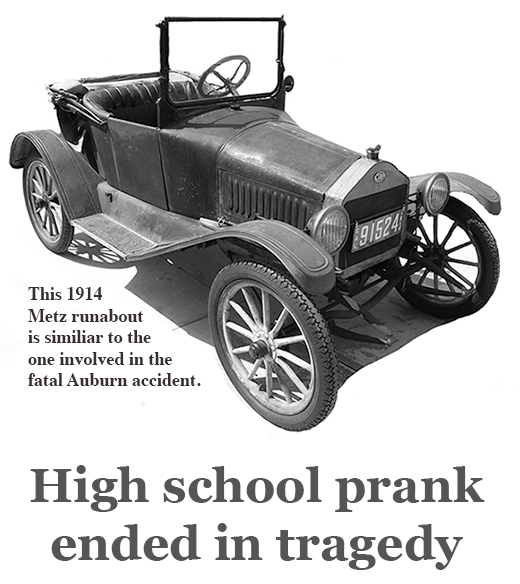 The spectacular crash of a Metz runabout, built to carry a driver and one passenger, prompted city and school officials to intervene in what had been a traditional night of fun and games for city high school students. The risks had become too great in the automobile age. The accident is of interest here because the lone fatality — a young man who was sitting on the door of the small runabout, and not inside the vehicle —was Andrew Francis Carrigan, whose name rests on a far-flung branch of the Major family tree. According to the newspaper stories after the accident, the teenager was known by his middle name, perhaps to avoid confusion with his father, Andrew Carrigan. Young Carrigan was one of three extra passengers, all of whom were on the vehicle, not in it. Two of them were sitting on the vehicle's folded-down cloth top, Carrigan on the driver's side door, his feet either dangling free or planted on the running board. What happened a few miles south of the city on June 10, 1915 is described in the newspaper article below. The account of the accident is confusing at times, but it is painfully clear what happened after the teenaged driver lost control of the car. Metz advertisements said the car was capable of going 50 miles per hour, which at the time was considered an incredible speed, particularly over the rather primitive road system. It's possible Francis Carrigan, who had dropped out of high school several months earlier, would have participated in this prank in any event, but he may have joined in because one of the targets that night was his older brother, John, an Auburn High School senior. The object, you see, was for underclassmen to find and kidnap seniors in an effort to prevent thm from attending the Class Day ceremonies the next day. One boy killed, another perhaps fatally injured, and three others hurt, two of them seriously, in a most distressing automobile accident at 11 o’clock last night, is the toll that youth paid to the annual Class Day orgies of the high school. The accident that cost the life of one youth and may claim another victim occurred near a turn in the West Lake short road, about three-fourths of a mile this side of Wyckoff’s Station when a small Metz runabout car driven by Lewis Brister, son of Mayor and Mrs. Charles W. Brister, and carrying four other youths, left the road and struck a large tree. The occupants of the car were hurled from the machine like pebbles from a slingshot. The car was reduced to a battered heap of scrap iron. • Francis Carrigan, 17 years old, dead. • Frederick Stickles, a high school freshman, 16 years old, suffering, it is thought, from a fractured skull and a number of serious cuts and bruises and may have serious internal injuries as well. He is at the hospital in critical condition. • Lewis Brister, 17 years old, a broken left forearm and wrist and cut about the face. May have internal injuries. In the City Hospital. • Clarence Corning, 19, broken collar bone, cuts and bruises. Taken home this morning. • Theodore Schmitz, 19, cuts and bruises and suffering from shock. He is the least injured and is able to be about today. THE DEAD BOY, A. Francis Carrigan, was a junior in the high school during the first part of the year, but left school in the winter and has since been employed at the Lewis Drug Store at the Five Points. He is the son of Mr. and Mrs. Andrew Carrigan of 132 Franklin Street. Besides his father and mother, he is survived by a brother John, a high school senior, and a younger brother, Harold. Frederick Stickles, the youth who may have received fatal hurts, is a freshman at the high school and the son of Mr. and Mrs. Edward Stickles of 128 South Fulton Street. Clarence Corning was a third year student at the school during the first part of the year, but has not been in attendance for some months. He is the son of Mrs. Rebecca Corning of 6 Liberty Street. Theodore Schmitz, the least injured, has not been in school for several months. He is the son of Mr. and Mrs. Henry Schmitz of 96 Liberty Street. THE ACCIDENT, with its toil of death and maimed youths is one of the most distressing that has ever occurred in this vicinity. Coming as it did near the closing of the school year it has thrown a pall of sadness over the high school that has sunk deep into the hearts of student body and faculty alike. Its every detail makes it a story of distress to relate, coming as a horrifying climax to a night of high revelry on the part of a large percentage of the underclassmen at the school in their annual pranks upon the senior class, which was to have held its Class Day exercises today and for which an elaborate program of fun had been prepared. All evening, underclassmen were about the city seeking prominent members of the senior class, spiriting them to places far out of the city in order to prevent their appearance at the exercises today. Youth was having its fling. Animal spirits bubbled over. Pranks of all sorts were being played upon the seniors and it was a night of fun until 11 o’clock when suddenly there came the news of the tragedy on the road outside the city. One of their number had been killed. It came like a bolt and struck to the very heart of every boy. Laughter and gaiety were transformed with the sad blow to tears and weeping as the horror of it all came first like a blow and then its terrible meaning percolated home to them. The festivities of the night ceased in an instant. The mirth and fun was turned in a twinkling and became a hollow mockery. THERE WERE more than 100 of the boys about the city and the news spread like wildfire as their fellow students, who witnessed the tragic ending of the night of fun, told the story in tears and sobs. Then they went to their homes, all save a few who, deeply saddened and horrified, ceased their rollicking revelry and gathered in dejected and sad little knots on the street corners to discuss in subdued tones the terrible thing. The story of the tragedy at the turn of the country road is not a long one, but one that is literally steeped in distressing details. The very youth of the victims into which the hand of death reached from the darkness unseen and lightning quick, makes it one that is terrible to relate and none the less terrible to hear. The occupants of the death car, only one of them, Frederick Stickles now an active student at the high school, with two other cars loaded with boys, drove out into the country in search of two prominent members of the senior class who were hiding there. 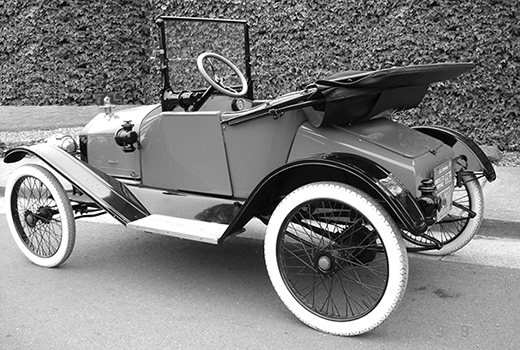 Beside the ill-fated little Metz there was a large Cadillac touring car driven by Harold Curry, a freshman at the school. With him were Norman Stone, a junior, who resides with his parents at 20 William Street; Austin Failey, a post graduate student of Baker Avenue; Charles Sullivan, a sophomore of Woodlawn Avenue, and Charles Hudson, a sophomore and son of Dr. and Mrs. William T. Hudson of 20 William Street. A Ford touring car, carrying another load of boys, was also in the senior hunting expedition. This was driven by Kenneth Sheldon, a sophomore of Franklin Street. With him were Charles Howell, a post graduate and a son of Rev. and Mrs. Howell of Amboy; Paul Lane, a junior; Harold Lester, a former student, and William Harrington, a sophomore. THE TWO SENIORS for whom the automobile expedition was hunting were Eddie Sherlock and John Carrigan, the latter a brother of the dead boy. These two boys had gone to the farm house of Henry Burlew near Wyckoff’s to spend the night, knowing they would be sought by the underclassmen and probably hazed and left at some lonely spot miles from the city as they were among the ones marked by the underclassmen for capture. Their exact hiding place was not known, however, and after a search of some of the camps in the neighborhood by the party, who failed to find them, the three automobiles started back to the city. The Ford car driven by Sheldon was ahead. The little Metz car driven by young Brister followed it and back of that came the big Cadillac with its load. All of the cars were started at a fast rate of speed and it is said that they were running faster than 40 miles an hour when the accident happened. JUST EXACTLY what happened none of the boys seem to know. The least injured, Schmitz and Corning, who were on the death car, were hurled far out of the car and were so dazed that they have only a hazy conception of what actually occurred when the car hurled young Carrigan to death and shot the others out into space. Boys who were in the other cars and gathered at the scene soon after it happened have different versions and stories of how it happened. When it was over last night, interviews with those at the scene elicited only excited and disjointed narratives of the tragedy. Piecing the fragments together, however, a pretty clear story of the accident was obtained by the reporters and Coroner A. J. Forman, who was called soon after the youths were brought to the hospital. The Ford car was racing at a high rate of speed and had made the curve in the road which is opposite Peterson’s Point on the lake. It raised a heavy cloud of dust which is said by occupants of the Brister car, momentarily blinded them. Young Brister, driving the little Metz, had not known about the curve, but negotiated it successfully. The car, a small one, was doing about all that it could. On either side of Brister at the wheel sat Stickles and Carrigan, the latter sitting on top of the right hand door, a rather insecure seat. Perched on the smashed top on the rear of the car sat Corning and Schmitz. TWO MINUTES before the accident happened, young Corning shouted to Brister to reduce the speed. “Cut it down, don’t drive so fast,” he shouted in the ear of the driver. Schmitz, sitting by his side, laughed, “Let her go, Brister; go on, let him run it as fast as he wants to,” he said. The speed was not slackened. Rounding the curve in the road and almost before they had struck the straight stretch of road ahead, the car, listing under the swaying overload of humanity, swung to the edge of the road. A cloud of dust cut out the white stretch ahead and Brister was driving by feel. Suddenly there came a jolt as the front wheel of the car struck a tree, tearing loose the wheel and letting down the front corner of the car. Brister had completely lost control of the machine. There was no time to stop it; to turn it; to do anything. An instant after the first jolt there came a second one as the car smashed itself head on into another tree a few rods farther on. There was a loud crash as the little car coupled together into a mass of twisted machinery and broken metal. CARRIGAN, sitting insecurely on the top of the door, was shot forward six feet and smashed against the tree, his face and head striking it. When he was picked up he lay near the roots. Stickles, on the other side of Brister, was shot ahead and straight through the windshield and fell a few feet ahead of the car. Brister was thrown out to one side. Corning and Schmitz, perched above the others on the lowered top of the car, were catapulted ahead like missiles from a mortar. Schmitz was shot a distance of 38 feet, a measurement taken this morning showing this fact. Corning was hurled upward several feet over a limb of the tree, turning somersaults as he went and landing in a small ravine at the roadside 35 feet away from the car. That these two young men did not receive more serious injuries is considered a miracle by those who have viewed the scene of the accident. The Ford car ahead heard the terrific crash and stopped, turned around and went back to find their companions strewn about the ground and the car wrecked. The big Cadillac car coming from the rear was stopped by the occupants of the Ford car. Bradford Greenfield and William Monroe and two girls who had been touring along the lake road had been passed by the other cars on the road and were close at hand when the accident happened. Some of the occupants of the other cars had believed that Greenfield’s car held the fugitive seniors. Greenfield heard the crash and was soon at the scene and with the others helped to load the injured young men into the automobiles. BRISTER, Stickles and Corning were all placed in the Ford car and the whole party in its excitement was about to leave when from the darkness near the car came the gurgling groans of Carrigan and they went to him. He lay near the foot of the tree and about him the ground and the wrecked car were bespattered like a butcher’s shambles. His face was smashed out of all semblance of recognition and from a huge split in his head a crimson stream flowed. It was a sight that turned his companions in fun a few minutes before sick, but they placed tender hands beneath him and lifted him into the Cadillac car and hurried him at top speed to the City Hospital. The other Ford with its load of injured followed, Greenfield and Monroe bringing the Schmitz boy with them. All were taken to the hospital, where Carrigan died without regaining consciousness ten minutes after being taken there. Dr. Ledra Hearlit was called and with Dr. Raymond Johnson of the hospital staff attended the injured youths. The Cadillac car then returned to the scene and brought the others to the city. PARENTS of the boys were notified and went to the hospital. The scene of grief at the Carrigan home, when the news reached there, was of such a distressing nature that it has no place in a recital of the tragedy. Mayor Brister hurried to the hospital where he remained with his son all night. It was necessary to place the young man under a deep anesthetic during the night. Today an x-ray picture revealed the fractured arm and wrist. Mayor Brister, whose cup has so recently been filled with sadness through the drowning of his son, Paul, was deeply affected by the accident and doubly so because he was the owner of the ill-fated car. Frederick Stickles was unconscious during the night and partly regained consciousness during the morning. His condition showed some improvement this afternoon and hopes for his recovery are held out although his condition is considered most grave. The fracture of the collar bone suffered by Corning was reduced last night and he was taken to his home this morning. SCHMITZ'S INJURIES were dressed and he went home early this morning. Interviewed by a reporter, Schmitz told his story of the accident. “The next instant there came another crash and I felt myself being shot through the air as though something had picked me up and thrown me. I finally landed and I picked myself up. I was dazed and didn’t know what happened to me. Another Metz runabout, this one from 1915, illustrates the precarious positions of three passengers. Clarence Corning and Theodore Schmitz, according to the story above, were seated behind the front seat on the folded-back convertible top. Ill-fated Francis Carrigan was said to have been seated on the door (or perhaps standing on the running board, leaning back against the door). DURING THIS period, newspapers openly speculated on the fates of persons sent to hospitals for accident injuries or bullet and knife wounds, often saying these people weren't expected to survive. I suspect this was the way to cover themselves should the number of fatalities rise after the newspapers hit the streets. Typically, however, those put on death's door recovered, some rather quickly. Frederick Stickles, the high school freshman listed as the most seriously injured among the four survivors of the accident, was released from the hospital 12 days later. The complication was ... he had to stay with neighbors for awhile because his home was quarantined as a result of a case of scarlet fever in his family. Stickles dropped out of Auburn High School in 1917 to join the Navy, serving on convoy duty during World War 1. After the war, Stickles moved to New Hartford, New York. Death didn't catch up with him until 1996, the year he would have celebrated his 96th birthday. CLARENCE CORNING, who was thrown through a clearing in the tree that had brought the car to such an abrupt stop, recovered nicely, but was put to the test a year later when he was riding on the back of a motorcycle driven by Charles Sullivan (mentioned in the newspaper article above). Fearing a collision with a Buick touring car, Corning jumped from the motorcycle, breaking his left leg and sustaining a scalp wound. Sullivan managed to avoid the collision and kept driving, unaware he had lost his passenger until he said something, and Corning didn't answer. He turned around and found Corning lying in the street. Like many young men at the time, Corning enlisted in the service, joining the Navy to serve during World War 1. After the war he returned to Auburn, worked as a sales representative for awhile, then became a partner in the Clark and Corning Liquor Store, retiring in 1965. He died four years later, at the age of 72. His son, Peter Corning, served as an Auburn councilman until he was elected Cayuga County District Attorney. Later he became a Superior Court judge. THEODORE SCHMITZ, least injured of the four survivors, would be the first to die, in 1922, after a lengthy illness. He became a football star at Auburn High School, then attended Buffalo University, where he also played football. When he returned to Auburn, he went to work at the uncle's pharmacy, but in 1921 came down with the unspecified illness that took his life a year later. Lewis Kyle Brister enlisted in the Army, and when he returned after the war was active in veterans' organizations. When he died in 1973, Brister was living in Coral Gables, Florida. Tragically, his son, Lewis Kyle Brister Jr., died in an automobile accident in 1971 on Interstate 87 north of Albany. He lost control of the car after he hit his brakes to avoid a car that cut in front of him. His car skidded out of control and plunged 100 feet over an embankment. A veteran of World War 2, Brister Jr. worked for Georgia-Pacific in Plattsburgh, New York. In the meantime, another of Mayor Charles Brister's sons had followed in his father's footsteps. Carl Brister, older brother of Lewis K. Brister Sr., was mayor of Auburn in the 1940s. As for Auburn High School's Class Day celebration, things changed. In 1916, the year following the accident, there was a concert at the school. There were no pranks.